In this download Steve shares his closely guarded secrets, honed through thousands of real world performances. You not only tell them the WORD they are thinking of, YOU PREDICT IT! ANYWHERE, ANYTIME and with ANY BOOK. "I've been running the lectures at the Magic Castle for over 30 years. This is by far the greatest book test I've ever seen, and I've seen them all". A real 'worker' from someone who has obviously performed this gem for years in his own shows. Highly, highly recommended." "I saw this done by Steve, 15 or more years ago and I remembered it to this day. I'm shelving my other book tests! The wait has been long and I applaud Steve for finally opening his vault to release this. 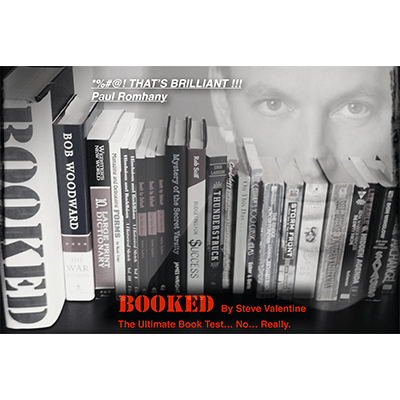 BOOKED is a winner!"